PLANHEAT - First training courses are starting! After our successful launching events in Krakow and Brussels, where we validated the first PLANHEAT tool results with stakeholders, we have the next highlight in store for you! Just in time after the summer break, the first training courses will be held in September. Join the PLANHEAT coordinator to gain an overview of the training schedule and the training modules on 4 September and participate in the Module 1 Training Webinars during the course of September (see training schedule below)! In addition, we have now opened the process to welcome cities dedicated to decarbonising their heating and cooling systems as well as companies working with cities to the project. Become a PLANHEAT city too and enjoy the maximum of the PLANHEAT offerings! First online training sessions starting in September! This September the first training courses on Module 1 of the tool are taking place, starting with a kick-off webinar on September 4. In Module 1 you will learn about the mapping process, the format of data needed and where to find data in publicly available databases. The webinars are designed to cater to different region’s needs and specificities: dedicated webinars will be held for Northern, Eastern and Southern Europe and the Balkan region. Choose the webinar according to your region and reserve your place! 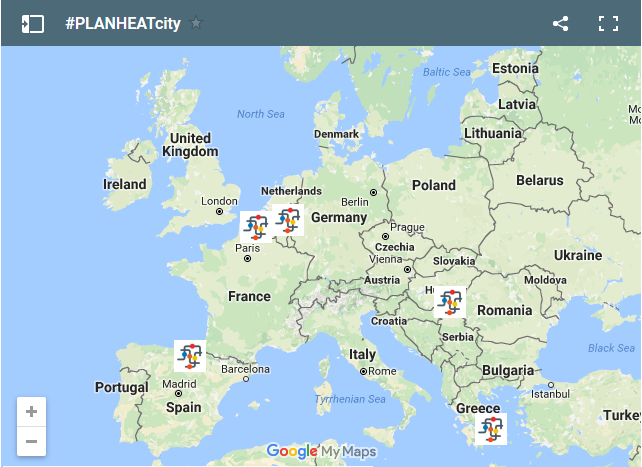 The cities of Athens, Lille, Szeged, Vitoria-Gasteiz and the consulting company Escoplan BV have already officially joined the PLANHEAT project! What are the benefits of joining the project? We will screen in depth your needs and support you throughout your heating and cooling planning process! Membership is open to public authorities (municipalities, regional agencies, ...), associations and companies working with municipalities in heating and cooling planning. Would you also like to join and enjoy all the benefits? The process is quick and easily completed by signing a letter of intent. Funded by the European Union's H2020 Programme under grant agreement 723757. The sole responsibility for the content lies with the authors. It does not necessarily reflect the opinion of the European Union. Neither the EASME nor the European Commission are responsible for any use that may be made of the information contained therein.